Alonso Lopez set the seventh fastest time in the warmup, clocking a 1:50.296. The Spaniard would start from 17th on the grid, due to having encountered traffic in the decisive moments of Saturday’s qualifying session. He lost a place at the start of the race, but quickly won it back and began a spell of consistent progress, moving into eighth place with 9 laps remaining. One lap later, he received a knock from John McPhee at Turn 13, and could not keep upright. 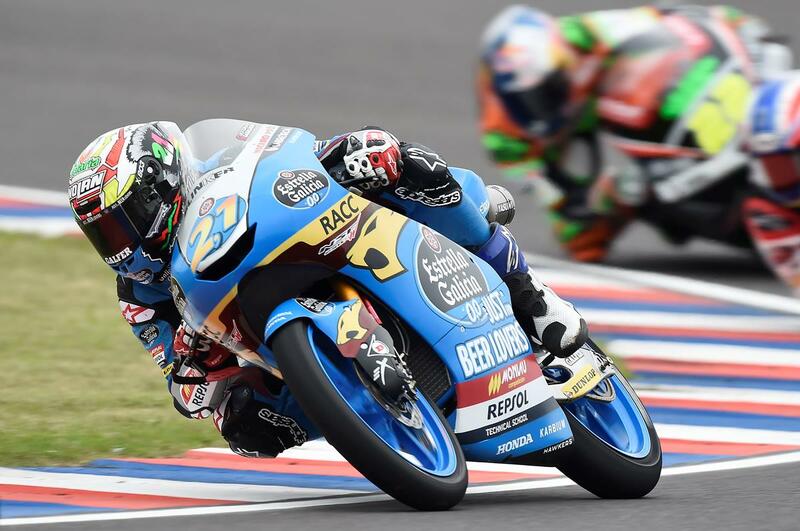 He crashed out of the race, and leaves Argentina 12th in the standings, with 4 points. Teammate Sergio García suffered a crash in the warmup on Sunday. After a medical at the circuit, he was diagnosed with a slight concussion and was refused clearance to start the race. Garcia has been transfered to the Hospital de Santiago del Estero facility, where he will undergo a CAT scan. He will be aiming to make his full Moto3 World Championship debut in a fortnight’s time, in the USA.